In side slope failure, due to saturated Levee slope from heavy rains, leaving a 10’ wide water side portion of Levee standing against an already high water elevation and heavy flows due to extreme run off. Dutra was call for an immediate emergency response to rebuild the Levee section before it failed and created a breach in the Levee, flooding the Island and parts of Walnut Grove. This project was unique compared to other projects in the fact that it was an immediate response emergency call out to save the Levee section, prevent a Levee breach and to provide safety to the public and homes in the area. The Dutra Group was called by the District Engineer on 2/13/2017 at 1000 hrs. 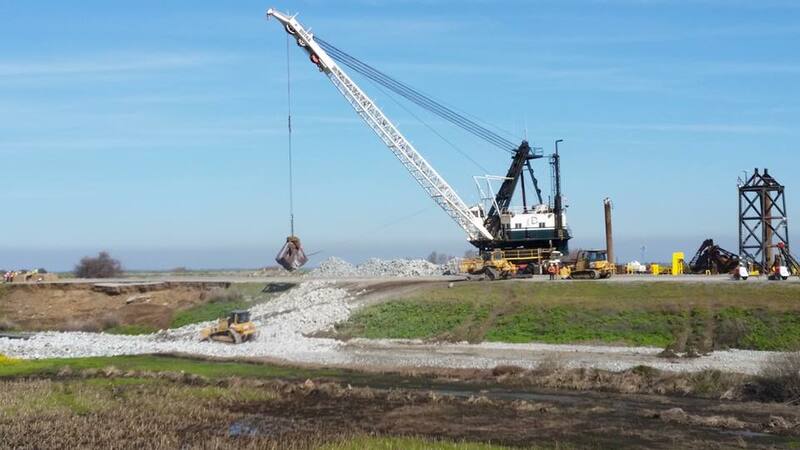 The Dutra Group had a Crane barge, loaded rock barge with tug on site placing rock as directed by 1130 hrs. the same day. Also, there was mobilized within 2 hrs., assist equipment, 2 dozers, 416 back hoe, 84” pad foot compactor, porta potties, and light plants with supervisors and employees to operate at a 24-hr. basis. The Derrick Barge 24 was also mobilized out of Dutra Rio Vista facility to assist. Under direction of the district there was placed 9,024 tons of rock product placed brought from Dutra’s San Rafael Rock Quarry by barge and tug 65 Nautical Miles away. In addition, with that 8,182 tons of fill was placed and brought by barge and tug from Decker Island 20 nautical Miles away. 2 tug boats were used on project and coordinated with Caltrans and the Mokelumne River bridge openings. Project was completed on 2/16/2017 4 days later with no safety incidents. © Copyright 2019 Dutra Group. All rights reserved.